Dubai is a city and emirate in the United Arab Emirates known for luxury shopping, ultramodern architecture and a lively nightlife scene. Burj Khalifa, an 830 meter-tall tower, dominates the skyscraper-filled skyline. At its foot lies Dubai Fountain, with jets and lights choreographed to music. On artificial islands just offshore is Atlantis, The Palm, a resort with water and marine-animal parks. Your holiday ends with breakfast this morning. You will be transferred to the airport and fly back to your sweet home.Day10 Delhi-Dubai(B) Today fly to Dubai. Arrive in Dubai, the quintessential land of opulence, wealth and astonishing skyscrapers that stand alongside ancient mosques. Take the rest of the day to rest, relax and acclimate to the adrenaline-charged tempo of this city and your new time zone. Meet, greet and assit at airport ( OUTSIDE) with our English speaking guide, Transfer to hotel in Dubai. Free at leisure in the morning and then experience the new Dubai where the vision is larger than life. Driving down Sheikh Zayed Road admire the glittering high rises en route to Jumeirah area. 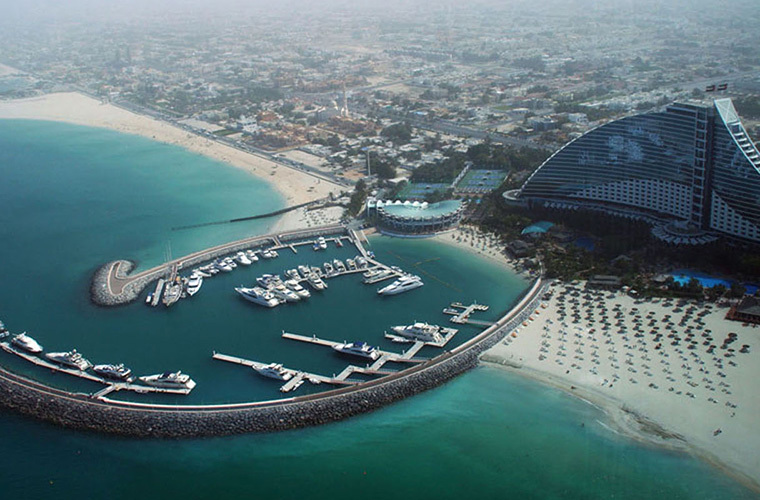 Proceed to Jumeirah, the picturesque palace and residential area of Dubai. Pass by the iconic landmark of Dubai, Burj Al Arab Hotel. Visit Souk Madinat Jumeirah, a beautiful recreation of an Arabian style market place. Drive to Palm Jumeirah, a fully reclaimed, palm shaped island that is home to the magnificent Atlantis, The Palm. Then visit Miraj Islamic Art Center. Our final stop will be Optional Evening Marina Dhow cruise with Dinner USD$85/ CAD110 person For a fabulous relaxing evening join our traditional Arabian dhow for a journey with a view of the fascinating skyline and scenery of New Dubai, Enjoy a sumptuous feast of International cuisine while gently gliding past the canal city along the Persian Gulf shoreline. Take a leisurely stroll along Dubai’s vast coastline this morning or head to the colossal Dubai Mall for shopping and perhaps indoor skiing on the vast slopes. Then join the thrilling Optional Desert Safari (USD$75/ CAD$100 person) this afternoon. 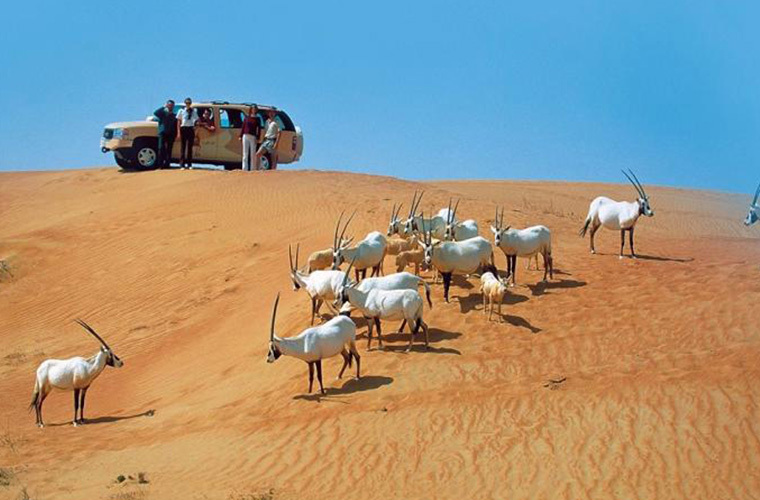 Board a 4X4 vehicle in Dubai and head out towards the highest sand dunes of the surreal surrounding desert. Feel the thrill of “dune bashing” as you spiral up and down the enormous golden dunes. Stop to watch the beautiful sunset before reaching the Bedouin Campsite. You’ll be welcomed with traditional Arabic coffee and might have the opportunity to ride a camel. Then, enjoy a specially prepared Barbeque Dinner, prepared on an open fire. Later, a captivating belly dancer enchants you with her swirling dances under the starlit sky before returning to Dubai. 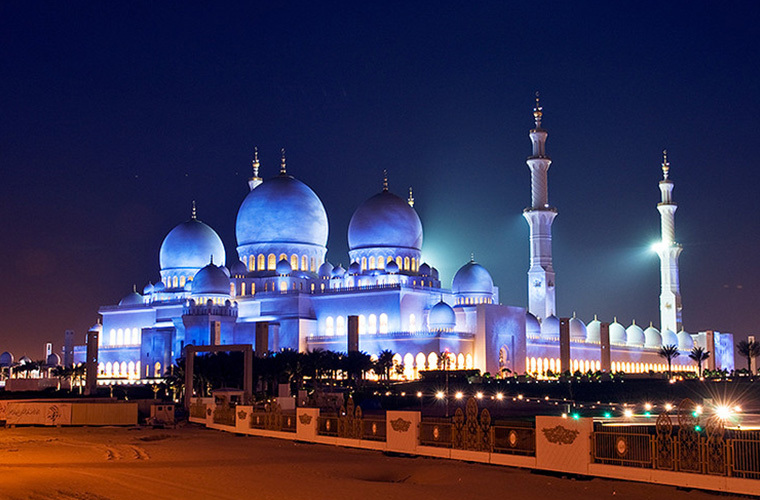 Discover the highlights of Abu Dhabi, capital of the Emirates, known as the Arabian Jewel. The tour starts with Yas Island, one of two newly developed destinations, provides photo opportunities of the vibrant Yas Viceroy Hotel built on the Yas Marina F1 circuit. The tour continues to Saadiyat Island, the other new destination with lofty cultural ambitions where a photo-stop is made at the UAE Pavilion, an award-winning fully recyclable building before visiting Manarat Al Saadiyat, a purpose-built visitor centre that brings alive the island’s extraordinary vision through scale models and a brief video presentation. Then we will have a panoramic drive along the beautiful corniche with a photo stop of Emirates palace Hotel. (if you selected optional tour, your trip will continue to visit Ferrari World Park). Before returning to Dubai, visit the Sheikh Zayed Grand Mosque at one of the largest mosques in the world. Dress Code: Loose long trousers or long skirts & long sleeves. No shorts for men, no tight & transparent clothing. Women must cover their head with a scarf. 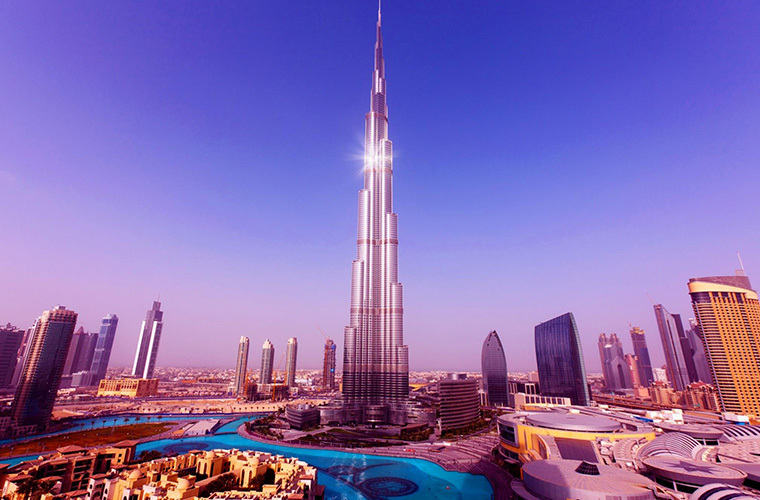 In the morning, you may join the Optional tour at Burj Khalifa (USD$85/ CAD$110 person), what is currently the world’s tallest building, the Burj Khalifa. 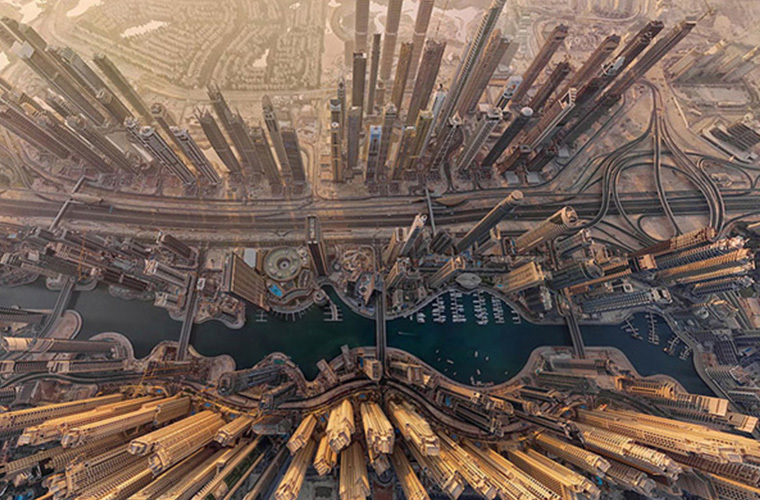 Climb the tower to have a panoramic view of Dubai. Here you have time to admire the Dubai Fountain, a spectacle of lights and sound and one of the world’s largest performing fountains. The tour continues to Al Bastakiya, the old part of Dubai, to reach the museum located in Al Fahidi Fort. All aboard the Abra (water taxi) to cross the Creek to the spice souk. You have a good opportunity to stroll and time to shop in the most famous landmark of Dubai – the gold souk. Transfer to airport for your flight at 11pm. • International airfare from Toronto/Vancouver in economy class and airport taxes. Clothing should be comfortable and casual—and since laundry service is available in virtually every hotel, we urge you to resist the temptation to over pack. When visiting places of worship, women should have their upper arms covered, and skirts or trousers must be at least mid-calf length. Men should avoid shorts. · Prescription medications—consider two sets, packed into different bags. Prescription medications should never be placed in checked luggage on international flights. · Keep a copy of your passport’s ID page and travel insurance policy in a separate location in your luggage. · Depending upon the kind of photographic gear you use, be sure to take sufficient film, tape stock or DVDs as the brands that you usemaynot be available locally. Bring extra camera batteries for all equipment, including your flash attachment and video cameras. · Also remember that for each plug-in charger required for your equipment, you also need an adapter for the electrical outlet. · If using a digital camera, youmaywish to purchase extra memory sticks and/or data cards so you don’t run out of space for the multitude of images you will undoubtedly snap. · Be sure to bring your camera’s instruction booklet because, even if you never needed to know before, on this trip you will certainly want to know how to increase your “depth of field,” i.e. to have in focus both your spouse in the foreground and the monument in the background. · It is best to ask before taking photographs of places of worship, tribal communities, and women, and photography is prohibited in high-security areas like airports and railway stations. India restricts re - entering the country within 60 days of your departure. Therefore if your trip requires you to have multiple entries into India you would have to apply for a double/multiple entry Indian visa that carries a remark that you would be re-entering the country within 60 days. To obtain this waiver you would have to provide your tickets and itinerary along with the visa form. Please be aware that it is the traveler’s responsibility to obtain all correct documentation prior to arrival in India. The Government of India in November 2014 has introduced TVoA (Tourist Visa on Arrival) enabled by ETA (Electronic Travel Authorization) to facilitate foreign travelers visiting India. · Foreigners whose sole objective of visiting India is recreation, sightseeing, short duration medical treatment, casual business visit, casual visit to meet friends or relatives etc. Not valid for any other purpose/ activities. · Entry into India within 30 days from the date of approval of ETA. · Valid for 30 days stay in India from the date of arrival in India. · Allowed to enter and depart from any of the nine airports, viz Bengaluru, Chennai, Kochi, Delhi, Goa, Hyderabad, Kolkata, Mumbai and Thiruvananthapuram. · Cannot be availed more than twice in a calendar year. Australia, Brazil, Cambodia, Cook Islands, Djibouti, Federated States of Micronesia, Fiji, Finland, Germany, Indonesia, Israel, Japan, Jordan, Kenya, Kingdom of Tongo, Laos, Luxembourg, Mauritius, Mexico, Myanmar, New Zealand, Niue, Norway, Oman, Palestine, Papua & New Guinea, Philippines, Republic of Kiribati, Republic of Korea (i.e. South Korea), Republic of Marshall Islands, Republic of Nauru, Republic of Palau, Russia, Samoa, Singapore, Solomon Islands, Thailand, Tuvalu, UAE, Ukraine, USA, Vietnam, Vanuatu. List of more countries for TVoA may be notified by Government from time to time. · Foreigners of above countries who holds an ordinary passport with 6 months validity. · Foreigners travelling on passport other than ordinary passport such as Diplomatic, Official, Special and Service Passports are not eligible for TVoA service. · Should not have a residence or occupation in India. · Travelers should have return ticket or onward journey ticket with sufficient money to spend during his/ her stay. · International travelers having Pakistani Passport or Pakistani Origin may please apply for regular VISA at Indian Mission. · TVoA links may also be found in website of Ministry of Tourism, Ministry of Home Affairs, Ministry of External Affairs and the Bureau of Immigration. The online application should be submitted minimum 4 days in advance and maximum 30 days of proposed date of travel. · Recent front facing photograph with white background and photo page of passport to be uploaded while applying. - Not applicable for Foreign Citizens requiring a double entry visa. No vaccinations are required before arrival into India. However, the CDC does advise that you take precautions against malaria. Mosquitoes are generally only found outdoors at dusk, however it is wise to be cautious. Do not drink water from the tap! While in some of your hotels the water is sufficiently treated to be drinkable, it is better to be safe than sorry. It is also easier to get in the habit of never using tap water, than to try and evaluate the situation each and every time. It is also recommended that you use bottled water to brush your teeth. Temperatures in India vary through the year and are different in North and South India. December and January can be chilly in the north, and wool sweaters or even a jacket are recommended. If you are travelling at any other time of the year, or to other parts of India, light cotton clothing will be sufficient. Comfortable and casual are the watchwords. You should also be sensitive to local customs, and stay away from very revealing clothing, especially outside the major cities. Those sensitive to air-conditioning might want to carry a small, light wrap to put around their shoulders. Do bring several sets of clothing, as the roads are dusty and although your vehicle air-conditioned, walking around will get clothes dirty fast! Laundry service is available in all the hotels so you can replenish your supply of clean clothing, as you need it. When visiting places of worship, women should have their upper arms covered, and skirts or trousers should be at least mid-calf length. Men should avoid shorts. Do carry an extra pair of socks in your handbag as you will also need to remove your shoes when entering sacred locations. Try to ensure that your shoes should be easy to slip off and on. Most international banks have locations in the larger cities throughout India, many with 24-hour ATMs. If you wish to change money during your stay, banks offer the best exchange rates, but you may also change money at your hotels. All major brands of traveller’s cheques are accepted in India, and major credit cards are widely accepted in most hotels, restaurants, and larger stores. (b) the aggregate value of foreign exchange including currency exceeds US$ 10,000 or equivalent. Do keep your currency exchange receipts as you may be asked to produce them upon your departure from India, or if you need to reconvert rupees into foreign currency upon departure. It is illegal for any Foreign Citizen to carry Indian currency into India. A foreign traveler to India would have to exchange his foreign currency into Indian Rupees upon arrival into India at the airport / hotel. There are 22 National Languages recognized by the Constitution of India, of which Hindi is the Official Union Language. Besides these, there are 844 different dialects that are practiced in various parts of the Country. The official language is Hindi in the Devanagri script. The States are free to decide their own regional languages for internal administration and education. English is widely spoken. Indian cuisine is varied and is not restricted to only curry. An authentic Indian curry is an intricate combination of a stir-fried Masala - a mixture of onion, garlic, ginger, and tomatoes; various spices and seasonings with which meat; poultry, vegetables or fish is prepared to produce a stew-type dish. The word Masala also means spice. Indian food is categorized into six tastes - sweet, sour, salty, spicy, bitter and astringent. A well-balanced Indian meal contains all six tastes and this is not always accomplished. This explains the use of numerous spice combinations and depth of flavour in Indian recipes. Side dishes and condiments like chutneys, curries, daals and Indian pickles contribute to and add to the overall flavour and texture of a meal and provide balance needed. Most of the spices used in Indian cooking were originally chosen thousands of years ago for their medicinal qualities and not for flavour. Many of them such as turmeric, cloves and cardamoms are very antiseptic, others like ginger, are carminative and good for the digestion. All curries are made using a wide variety of spices. The baggage allowance on various Indian domestic carriers which includes Air India, Jet Airways and Indigo Airlines, Jet Airways and its subsidiary airlines JetKonnect has been revised as detailed below. The same is subject to change without any prior notice. Cabin baggage will be restricted to 7 kgs, as before. Excess baggage payment on Jet / Jet Konnect and Air India is payable at the time of check-in. This cannot be pre – paid.